As a historic costumer, every project is a balance between complete historical accuracy, and the demands of the modern world. Should I spend a fortune on period fabric, even if the fabric would have been the cheapest, lowest fabric at the time, but is now prohibitively expensive? How do I do the work accurately, without devoting too much of my life to it? What if the fabric literally doesn’t exist anymore? When you add the element of theatre, the demands increase. As Mrs C has pointed out, theatre costumes are usually done on a budget, and a time budget. Theatre often involves quick changes, and it is all done under stage lights, which are very warm. So not only do costumes need to be as light as possible, but even then, actors sweat in them. And they roll around onstage and get into fights and carry props and generally get dirty. And theatre shows generally don’t have the budget and time for drycleaning. So theatre costumes need to be washable. All of these applied in making the costumes for Home. I had a budget, a timeframe, but the other stuff was more important. Stuart had to be relatively cool as he played Johnnie – which meant a heavy wool uniform wasn’t a good idea. He also had to be able to change from a civilian to a soldier onstage – by putting on a coat and jacket. His uniform details needed to be accurate enough to keep the keen war historians happy, while being cleanable and comfortable. I started my planning for Johnnie’s outfit by researching the uniforms worn by New Zealand WWI soldiers, particularly gunners in the New Zealand Expeditionary Force, the Wellington Infantry Battalion. 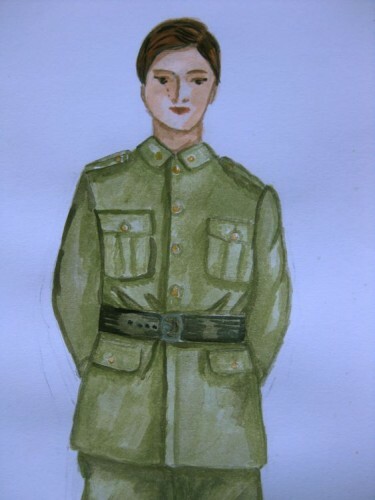 I found the Te Papa collection of Barry & Co. portraits of departing soldiers and their families particularly helpful. The zoom function (love that zoom function!) let me clarify all the construction details, and the fact that they were all done in a Wellington portrait studio fitted perfectly with the Home story. 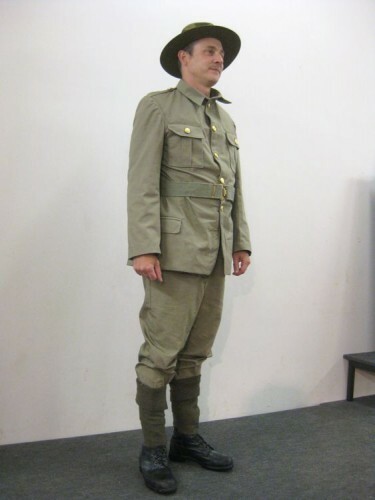 Next I looked at every image I could find of extent New Zealand WWI uniforms (there really aren’t very many left), to get a feel for the garment, and to determine the colour of the fabric. 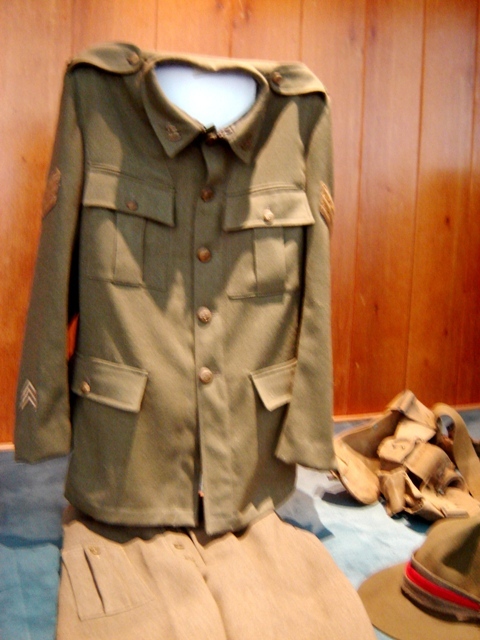 There are a few shots of displays at the New Zealand Army Museum Waiouru, and one jacket on display in Turkey, and that’s about it. I also looked at paintings, like this one, and tinted photographs, like this one. I even looked at WWI reenactors, like the New Zealand Mounted Rifles Memorial Troops. 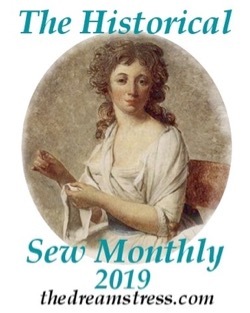 Finally, I read lots and lots of books: books about the wool industry in New Zealand, about knitting and weaving in New Zealand. Books about WWI as an overview, and a few of the many, many published diaries and letters of soldiers – to see what they said about their uniforms. What I found is that there was a wide variety of fabrics used, and a wide variety of construction techniques. New Zealand hadn’t been preparing for war, and hadn’t been preparing to uniform thousands of men. Different lots of wool were dyed to match a basic khaki colours, the dye varied batch to batch (and has been fading differently on different extent uniforms). Local tailors made up uniforms. Wives and mothers sewed on buttons. Some men got uniforms that fit well, some men didn’t. 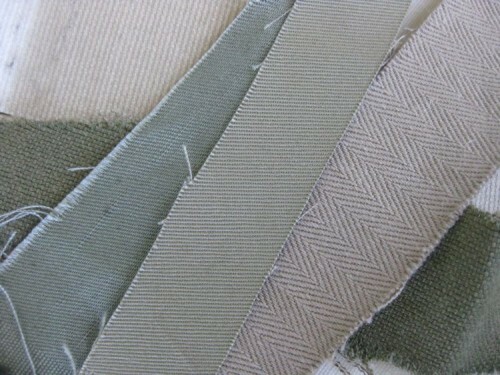 None of them were perfect to me, but the cotton twill on the top of my stack worked best. I loved the texture and colour of the bottom fabric, but the weave was too loose to set welt pockets into. The cotton twill was a good colour, a good weight and hand, and wouldn’t be too warm to wear. To give the fabric just a little more weight and structure, and a little more protection from the actors skin, I flat lined the jacket in cotton muslin (and I took lots of pictures so I can do a tutorial!). I did not flat line the pants. After that, it was just about finding a pattern. I used a combination of vintage pattern reference books, a modern man’s suit pattern with a similar cut, and my copy of a late 19th century tailors manual. 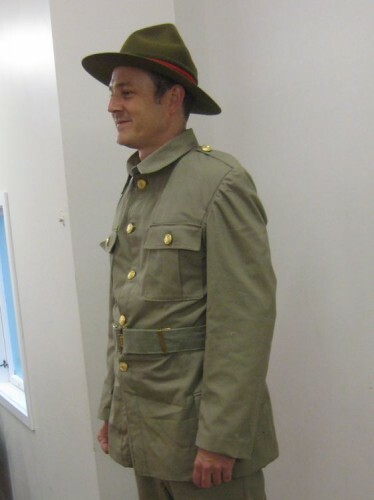 It may have been almost 20 years old in 1914, but I know it was used by New Zealand tailors well into the 1930s, so it’s perfectly plausible that it was used as a reference by a tailor making up a WWI uniform. After that it was just about sewing it up, having a couple of fittings, and sending the uniform out into the great world of theatre. The pants can be worn without the putti (those wool things wrapped around his legs) and with a suit jacket as a civilian outfit, and with a wool undershirt and braces as Johnnie’s military undress in a camp in the desert. There is the tiniest bit of sclumping in the shoulders, but I think that fits well with the hurriedness of the war, and lends a note of accuracy. The buttons are generically ‘military-ish’, and the belt came from a Army-Navy surplus-type store. Overall, it’s a good blend of theatre and reality. I’m pleased. 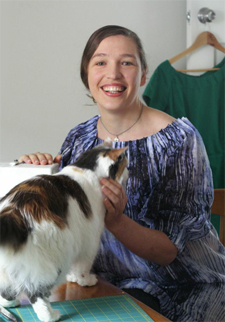 And it was fun to do something other than corsets and pretty princess dresses! I like ‘sclumping’! Good new word. Much respect for your research for the uniform. It is indeed a great blend of theatre and reality. Sclumping just seemed to describe what it was doing perfectly. 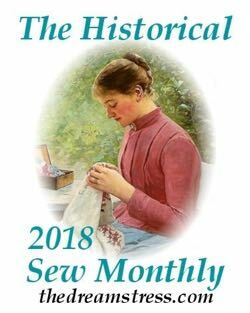 I was taught flat lining from someone who had been sewing since well before WWII, so I don’t think it’s a particularly newfangled phrase. 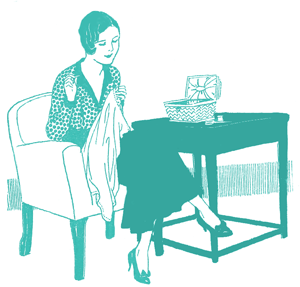 As I was taught, interlining is slightly different than flat lining in that it is usually done with much finer, lighter fabrics, and ‘interlining’ implies that it will have another lining as well, so the interlining will be completely hidden. 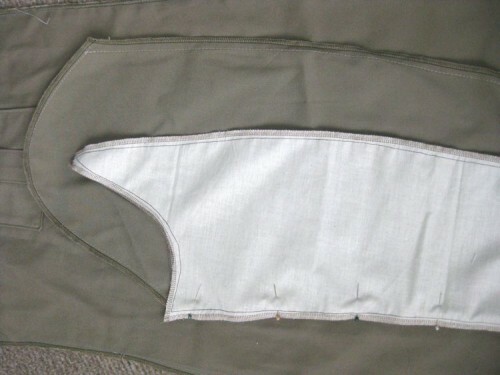 Interlining is to support the outside fabric without adding weight or changing the hand, flat-lining gives the outer fashion fabric the hand of the lining. So the sleeves and collar of the leaf green velvet jacket are interlined with muslin gauze, because it is hidden, and very lightweight. It exists to strengthen the velvet, not to change the way the velvet hangs. It’s a very subtle distinction – and not particularly important or useful! I don’t know if this is the least bit canon, or just a quirky idiosyncrasy that I was taught. That makes a lot of sense – thank you. I have been flat lining all these years, though with normal lining fabrics, mostly. Yes, interlining should be between two things, shouldn’t it! That’s so cool. You’ve done a great job of balancing all those conflicting requirements and producing something that combines aesthetics with functionality. Not an easy task. Thank you! That’s exactly what I was aiming for. It’s fantastic! You did such an amazing job. And of course uniforms wouldn’t have been “uniform” but we’d assume they were as they are these days. So much more interesting to think of them being all so different and being thrown together from whatever was available. Those poor soldiers, some of them would have been really uncomfortable! Thank you! That’s high praise from you. I think most of the soldiers would have been really uncomfortable – lots of them got sent to Egypt with these incredibly heavy wool uniforms. Others ended up in trenches for months on end, and of course the uniforms weren’t remotely washable. Lice could (and did) live in the fabric. And under them they wore wool singlets. And they had to rely on their families to send them underthings. It must have been ghastly. And then there was the war to face! The details like ‘wives and mothers sewed on buttons’ stab me. The US doesn’t teach how awful WWI was, so when I moved to Canada as a kid and learned about it, it affected me so deeply. Those little details you tell make me so sad for all of the individuals with stories who went there. I hope that the play goes well. You really make each costume an individual expression. Reading the diaries and letters was really amazing. All the details. So often the guys tried to be so chipper and brave writing home, and their diaries tell a much harder, darker story, and at the same time those at home were doing the same thing. I had the same experience with WWI history in the US. It would have been 5th grade, and we had to write a story about a US War, and WWI wasn’t even on the list. I knew all about it from reading Rilla of Ingleside and other historical fiction, but thought that it wasn’t a big deal in the US because of that. It was an oversight that my official history classes never corrected – I learned about WWI from the years I homeschooled, and my own research. And it really is such an intricate, tragic, fascinating story. I admit that it makes me wonder if the US would be so gung-ho about war if we were taught the realities in school. I know I owe much of my pacifism to knowing that. And of course, pacifism extends to so many positive places. Does the play have a website? Or the theater company? It’s drab – but in a good way here. 🙂 I think you captured the feeling perfectly. Really interesting to see how you reconcile the different – and in many ways conflicting – requirements for this stage uniform. I think the result is a good one in that regard. I know this is too late to be of use to you in this instance but the ‘bible’ for NZ Army uniforms in the early 20th Century is a book called ‘New Zealand Army: Uniforms and Clothing 1910-1945’ (Christchurch: Wilson Scott, 2009) by Barry and Matthew O’Sullivan. 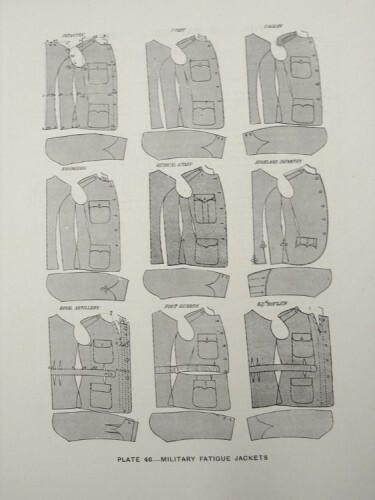 It documents every different type of jacket, trouser, shirt, etc, etc, design that was ever issued by the Army during this period and has a huge number of photos of original examples to accompany the text. Recently another book, Wayne Stack’s ‘The New Zealand Expeditionary Force in World War I’ (Oxford: Osprey, 2011) has appeared which contains a useful collection of 8 colour illustrated plates of the uniforms worn and is also accompanied by some great period photos of the same. I would just note that the uniforms were ordered from various NZ manufacturers to set designs and military dress regulations issued by the government. A rough ‘quality assurance ‘ process was in place to make sure these design requirements were basically being met (if you’ve ever picked up a genuine piece of ex-military clothing in a surplus store or op-shop and wondered what the weird designs – arrows, etc – stamped inside it were about, now you know – it tells the recepient, among other things, that the army quartermaster’s dept has approved it for issue). Uniforms were issued by Army quartermasters and came complete with buttons! 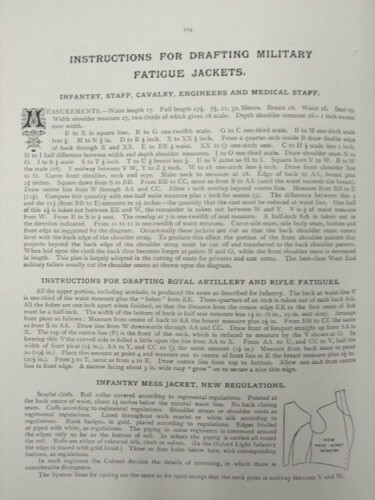 (which were also of standard issue, give or take some wartime shortages which occasionally led to substitution – but again this was just a substitution of one standardised design for another and no uniform was issued from Army stores without buttons). Wives, mothers, etc, may have sown on the odd loose button or in some cases helped an officer tailor his uniform to suit himself (they had more leeway than enlisted men in that regard) but your readers shouldn’t be under the impression that men were issued uniforms without buttons. You are right though about the variations in fabric, colour and sometimes cut, that arose despite the QA process because of the unprecedented scale of the orders being placed. In some ways nothing has changed for if you ever encounter a group of NZDF personnel in cams today you will almost certainly be confronted by a group whose camouflaged DPM shirts, pants and jackets vary in shade and colour from each other – again a result of slight variations resulting from different production runs (and time of issue) of said uniforms (and of course the elements and degree to which the garment has been washed will also take a toll and contribute to variations in appearance). Thank you so much for posting about the balancing act between accuracy, cost, and suitability for the circumstances in which a costume will be worn. I make most of the costumes for the dance troupe I’m in, and frequently feel guilty that items are not as historically accurate as I’d like (however impractical the alternative may be). It’s good to hear how someone else approaches this conundrum. I love posts like these–what a wonderful amount of thought and detail behind something that somehow brings the audience into the story without them even necessarily noticing! Totally fascinating! Next PostTerminology: What is alamode or allamode fabric?